Cedar Knolls, N.J., February 21, 2017 – To celebrate 25 years of providing the only egg that provides better taste, better nutrition and better freshness, Eggland’s Best (EB) is searching for the most passionate EB fan, who also happens to have an eye for taking beautiful photos of their delicious & healthy Eggland’s Best dishes! 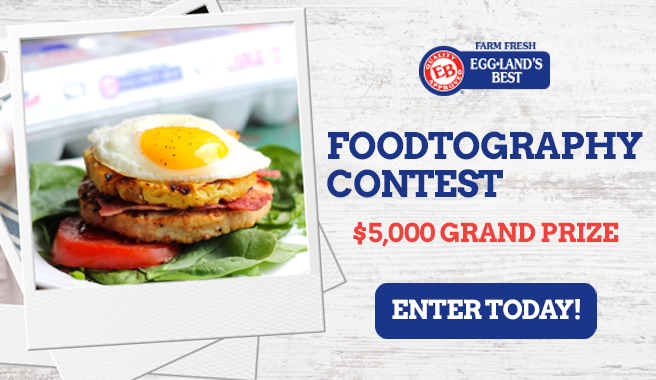 For the first time ever, EB is tapping into the “foodtography” trend and inviting fans to submit their best original “foodie” photos by April 12, 2017 for a chance to win $5,000 and a year’s supply of EB eggs! To enter, EB fans can visit egglandsbest.com/foodtography and submit two mouthwatering photos of their favorite EB dishes. All dishes must include at least two whole Eggland’s Best eggs and can be entered into one of four categories: breakfast/brunch, appetizer, main course, or dessert. Fans may enter once in each of the categories. All entries must include two original photos (one image photographed during preparation and one photo of the finished dish). Submissions will be judged on demonstration of passion for the superior taste and nutrition of Eggland’s Best eggs, photographic quality and composition, and originality and creativity. The five highest-scoring entries will be determined from each category for a chance to compete in the semi-finalist round where EB fans will vote to help select the finalist in each category. The finalists will then be revealed on the EB website where EB fans will once again have the chance to vote for the ultimate EB Foodtographer! Each finalist will be awarded $1,000 and a year supply of EB eggs, and the Grand Prize winner will receive $5,000 and a year supply of EB eggs! For Official Rules and to enter, visit www.egglandsbest.com/foodtography.